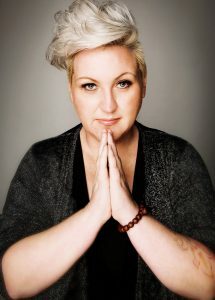 Meshel Laurie's Buddhism for the unbelievably busy | Daily Review: Film, stage and music reviews, interviews and more. Radio and television personality Meshel Laurie is also a practising Buddhist. In her new book Buddhism for the unbelievably busy (Black Inc.), she explores how applying some basic Buddhist tenets can help how to juggle the demands of work, children, ageing parents – and in this chapter below – how to stop craving for consumables you don’t really need. I’M UNBELIEVABLY Addicted TO STUFF! When the father of communism, Karl Marx, declared that ‘Religion is the opiate of the masses,’ he went on to explain that when people believe there is a great reward awaiting them – like heaven, for example – they are far less likely to fight for better lives here and now. If anything, there’s an understanding that the tougher our existence in this life, and the quieter we are about it, the more deserving we are of a great reward down the track. He argued that religion kept people docile by numbing their pain, like an opiate. Today, our religion is indisputably consumerism. Where our ancestors attempted to pray the pain away, we try to pay the pain away. 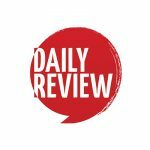 My friend Wil Anderson invited me onto his podcast, Wilosophy, not long ago. He asked me out of the blue how I was going with my consumerism. It made me laugh really hard because on the drive over to meet him, I’d suddenly thought to myself, Whatever happened to my Apple Watch? About a year earlier, I’d become obsessed with the Apple Watch and its promise to make me move and stand more often. I’m well aware of how pathetic that is, believe me. But I come from peasant stock, on both sides, and my body was designed to prepare for famine. Even though we immigrated to more indulgent shores some time ago, my body seems to think it’ll have to return to backbreaking farm labour at some stage, whether it ever gets to eat again or not, so best to store every calorie for a rainy day. Because my life has been devoid of physical exertion since the day I was born, I needed a gizmo on my wrist to tell me I’d been sitting still for too long. Anyway, I felt like I really needed that watch to be happy. I didn’t say it to myself in so many words, but I just couldn’t rest until I had one. I set it up and synced it with my other electronics. I conscientiously charged it every night while I slept, and checked my activity levels constantly through the day. Then I forgot to put it on one morning before work and now I have no idea where it is. It cost me about seven hundred bucks. I feel ashamed about that watch now. I’m ashamed of spending that much money when there are so many people who could’ve really used it, and there are so many better ways I could have used it myself. I’m ashamed of falling into a dissociative consumerist fugue state of lust for the stupid watch, especially as I’ve never worn a watch in my life. In fact, I don’t wear jewellery at all because it irritates me, so what made me think I could commit to a watch? Oh man, it’s just really embarrassing. I wish I could tell you I’ve completely outgrown opioid consumerism, but I’m currently living for my smart TV. At the time, though, I was supposed to be beginning a brave new life, living apart from my ex-husband for the first time in twenty years. Everyone was telling me I should be joining Tinder and ‘getting out there’ but I was feeling fat, unattractive and lost, as well as completely overburdened by a new job and not having anyone else in the house to help with the kids during those long hours after school. I felt a lot of pressure to pull myself together, but I really didn’t know how or where to start. My obsession with the much-hyped organising and movement-making gadget is starting to make more sense now, isn’t it? See what a little critical analysis can do? Buying the watch made me feel like I was doing something, moving in some direction, but of course it was an illusion, an opiate that numbed my pain for a short while. It gave me something to focus on and believe in, so I didn’t have to focus on my fear and sadness, and could ignore the fact I had no belief in myself. I wish I could tell you I’ve completely outgrown opioid consumerism, but I’m currently living for my smart TV. It’s huge, it’s mounted on my bedroom wall and it’s entirely possible it’s spying on me, but I don’t even care. Sometimes Mamma needs a little consumerist cuddle at the end of a long, hard day. Of course, Mamma needs to work long, hard days to pay for such indulgences. Damn you, critical analysis, don’t you have an off switch? Well, no, it doesn’t. But once you get into the critical analysis groove, it becomes more instinctive, and that can save you lots of time, money and embarrassment. In theory, I used to have a long break to look forward to at the end of every year, when my TV and radio shows went off air for about six weeks while Australians enjoyed summer outside. In practice, however, that time usually became filled up with helping other people clear their desks before their own breaks began. The fact that people like me had suddenly disappeared from the airwaves alerted the rest of the population that another year had almost slipped through their fingers. If you were supposed to have achieved some objective involving me, this was the time you’d flick madly through your notebook to see what you needed me to do so you could close out your year. That might’ve included a photo shoot, a recorded message, a meeting, a client Christmas party or a hundred other ‘little’ jobs that somehow took up a full day each to do. By the time I’d added them to all the domestic jobs I’d put off – like getting the car serviced, having a mammogram, or doing all the tasks my father dreamt up for me – I could very easily be halfway through my holidays without having enjoyed a single sleep-in. When you wake for work at 4.10 a.m. five days a week, sleep-ins are the only thing that can restore your faith that your life has some kind of meaning, so weeks of holidays without one was depressing beyond belief. Then it would be Christmas, of course, with all its attendant preparations and traffic, and before I knew it, it was January and everyone who’d wisely chosen not to blow their annual leave over Christmas would suggest we all get back to work a bit earlier, just to get a jump on the new year. So, I did the only thing I could think of to create some badly needed space in which to pull myself together after a very demanding year: I spent a lot of money on running away for the entire six-week break. I returned on Christmas Eve and left again less than a week later. I even went to places with terrible wi-fi so I couldn’t engage with anything work-related, even in the most minimal way. I made sure I was away until the final minute of the leave to which I was entitled, because I knew someone would attempt to steal the last moments of it from me, which they did. I also knew that they’d attempt to make me feel guilty for refusing, which they did. This was why I had to physically get away. Our unbelievable busyness partly comes from being trapped in a vicious cycle of needing to overwork to pay for treats that compensate for being overworked. Though my approach was extreme and a bit unbalanced, it taught me a valuable lesson about being overly accommodating at work. In most cases, after much huffing and puffing, my colleagues managed to juggle things and either found a way to accommodate my dates or they found someone else. For my part, I had to be okay with the latter, but that was strangely not as hard as I’d thought. The six-week sabbatical cost me a fortune. I had to board my dogs, hire a car, buy myself a plane ticket, buy my kids plane tickets so they could join me when the school year ended, and pay for accommodation, while at the same time losing money on jobs I’d normally be doing at that time of year. My ledger was definitely unbalanced! About a week or so into my break, having had more sleep and sunshine than in the previous six months put together, I sat down and drew a circle I’d been tossing around in my mind. It represented the work/treat cycle I suspected was a major driving force in my life. Basically, it went like this: I work harder than is comfortable, which makes me yearn for treats like holidays, clothes, electronics, etc. These things cost a lot of money, so I have to work harder than is comfortable. When it comes to dealing with this cycle of imbalance, it’s the chicken or the egg, isn’t it? Do you tackle the over-working first, or the treating yourself? I wondered if it was possible to create a life I didn’t feel the need to run away from. Could I live in a way that didn’t require treats to keep me going? Or would I still spend hours on TripAdvisor, planning my next escape but no longer able to afford it? Would I be content to wander around my house, feeding the chooks and reading with my dog on my lap, in between shorter bursts of working? I imagined quitting my job, selling up and settling the kids and me into a comfy little teepee somewhere. We could grow vegetables, and knit legwarmers out of our own hair to sell at the local markets. It sounds idyllic, doesn’t it? And I’m sure you’ve had similar fantasies (well, maybe not the bit about knitting legwarmers out of your own hair). But then I thought, surely there’s some middle ground between there and here, this place I’ve put so much work into? There must be something here worth salvaging? Of course there was, and Buddhism showed me how to find the middle ground. WHAT ARE YOU REALLY CRAVING? WHAT ARE YOU COMPENSATING FOR? I realised that the treat-seeking was just a classic case of good old-fashioned grasping, and, as we know, Buddha had a lot to say about that. As we discussed earlier, Buddha taught us that our suffering is caused by grasping for things (Upadana). And the first step, as always in Buddhism, is to get to the bottom of our true feelings. We need to figure out what we really want by asking ourselves that important question: ‘What am I attached to?’ We know that whenever we’re feeling troubled, it’s because we are craving something we can’t get. Whether it’s a sandwich or affection from a loved one, our inability to fulfil that craving will niggle away at us until frustration pushes us into action, usually negative action. So we need to stop ourselves acting out – like buying an Apple Watch, or planning an expensive overseas holiday – by identifying the source of our craving and dealing with it. If it’s actually physical hunger that’s making you crazy, take the time to eat. If it’s a harder craving to satisfy, take the time to look at it seriously and see what can be done. If nothing can be done – say, for example, because someone else is not prepared to give you what you want – face it and confront the reality of it. Your craving is your problem and no-one else’s. If it’s hurting you, no-one can stop it but you. So, what was really driving my six-week sabbatical? Quite clearly, I was craving more time for myself to do things I wanted to do. I was sick of that always being at the bottom of my priority list. I was craving more relaxed time with my children, so we could connect in a nice, gentle way without the demands of life encroaching on us. I craved time with them that wasn’t marred by my own tiredness or by my having to leave to go to work. I craved not being tired all the time. I craved working away quietly at some of my passions, with my dog at my feet, while the kids were at school. I craved having time to spend at my local Buddhist centre, learning from the lovely monks there and helping out around the place. I realised that this was not an unreasonable list, and no flights or gadgets were needed to achieve anything on it! As much as I’d love to win the lottery and never have a boss or need to work again (unless it’s on a project I find fascinating), that’s unlikely to happen. So I started making an effort to do little things for myself that made me feel like I have a life outside of work. Instead of booking flights after a long day, I’d book a movie ticket, just for me, to see one of those grown-up women’s films, or have a pedicure on the way home from work. In Part 2, we’ll look in-depth at other ways in which you can create space in your life to deal with what you’re really craving, and stop feeling unbelievably busy. We humans have a tendency to relieve our pain, rather than deal with the source of it. In our consumerist society, that pain relief often comes in the form of buying expensive things or indulging in extravagant treats. You could be unbelievably busy because you’re being overly accommodating at work. Try to set some boundaries and space for your personal life (within reason) and stick to them. The rest of the world will cope! Have you ever bought yourself something you didn’t really need, in order to feel better? Think back and try to work out what you were really craving at the time. Imagine that you’ve been transported to some magical place where all your normal responsibilities, schedules and commitments don’t apply. How would you spend your time? What would you like to do there? Once you’ve got a list, have a think about ways in which you might be able to incorporate them into your life as it is now. 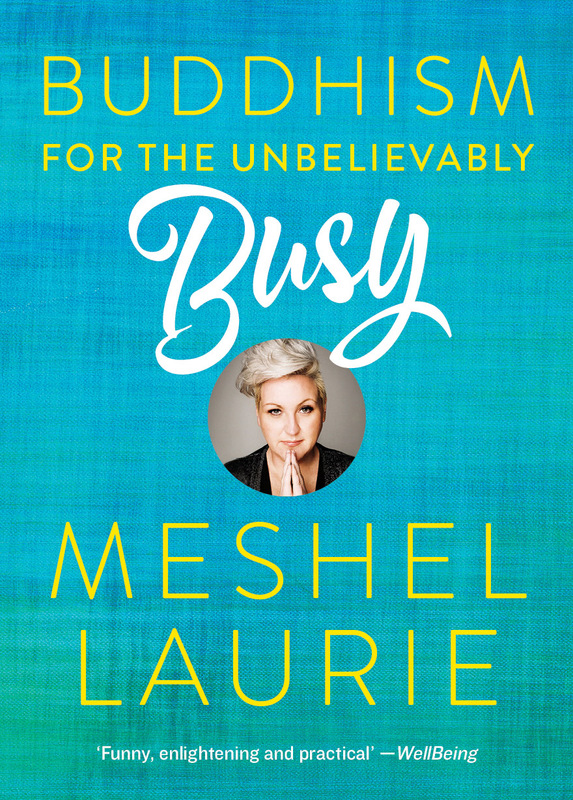 Buddhism for the unbelievably busy by Meshel Laurie ($27.99) is out now online or wherever good books are sold. She will be signing books in Melbourne today, Sunday 3 December at 1pm at Dymocks Chadstone, and on Saturday 9 December at 11am at Dymocks Southland and at 1pm Dymocks Knox the same day. For all information click here. Love your take on this. I’ve realised recently that my cravings have gone unmet for so long that I am not relieved by purchases anymore. I’ve stopped buying things because it doesn’t make me feel better. It felt strange and empty until you articulated what’s behind that. Thank you so much Mechel! I am in terested in what form of Buddhism you practice? 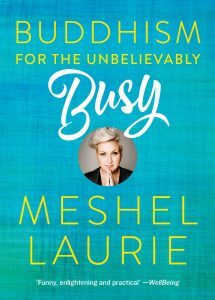 Thanks for sharing this Meshel. I understand where you are coming from. I seem to experience some form of cognitive dissonance when it comes to my dissatisfaction with life and it’s relationship with consumerism. I too purchased an Apple Watch, justifying it because I have no other jewellery, no tattoos and no body piercings. However, I have found it very useful in other ways. One thing I love is listening to music and with my Apple Watch I can listen to my stored music or to Spotify Premium via my watch and Airpods while working out at the gym without the need to have my iPhone nearby. I am also able to stop/start, adjust the volume and go to the next track or the previous track, using just my Apple Watch. When visiting other cities I do a lot of sight seeing and my Apple Watch comes in handy listening to music while walking. I just wish I had a later version so I could wear it while swimming as later versions are waterproof and can count laps. (Please note I have no shares in Apple….. unfortunately!). Nice! I took a different road to a similar place. My cravings led me to almost destroy myself with drugs and alcohol so when I realised I didn’t want to die I had to figure out a life that would allow me to live peacefully, not get too stressed or crazy. Find the middle ground as you say. Some 18 years later I work 3 days a week, teach and practice yoga on other days and play music with friends on the weekends. I also make sure I have one day each week with nothing at all scheduled and I like to ride my bike to the beach and swim and read and then cook something and have an afternoon nap and a bath in the evening. I practice a very simple form of mindfulness inspired by Tich Na Hanh – observe everything that arises in the present moment, without judgement. The last part is important. Our minds are problem solving computers that are constantly evaluating and judging everything. That my mind does that is neither good nor bad, it simply is. Continue to orient yourself to the time and place in the present moment & don’t get too drawn in my the constant chatter of the mind. It does what it does, let it be. Everything changes. Don’t be attached to either happiness or sadness, good or bad. Everything passes.